NASHVILLE, Tenn. — Meritor introduced a lighter-weight MFS+ steer axle and 13X drive axle at the Technology & Maintenance Council’s spring meetings. The MFS+ steer axle for linehaul applications is about 85 lbs lighter, thanks to a new gooseneck beam design and an offset knuckle with integrated torque plate and tie-ride arms, the company announced. 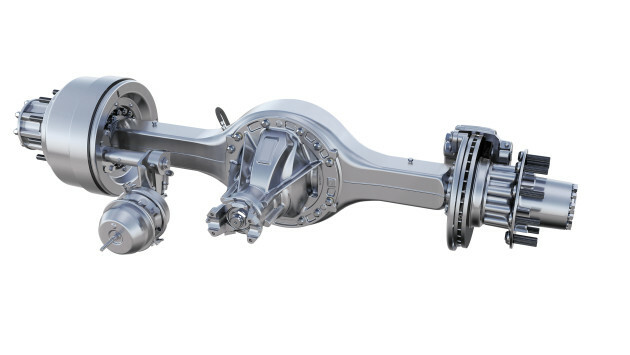 “With integrated components and an optimized design to reduce weight, the Meritor Front Steer axle (MFS+) represents the next step in the evolution of our front-steer axle offering,” said Chris Villavarayan, president, Americas for Meritor. It is available in standard and wide track configurations and has a gross axle weight rating of between 12,000 and 13,200 lbs. The new 13X for Classes 6/7 applications will enter production in the second quarter of this year, Meritor announced. The 13X will be available with ratios from 3.90 to 6.50 and gross axle weight ratings between 17,000 and 21,000 lbs. Meritor also announced it is extending warranty coverage fro its optional AxlePack7 on-highway trailer wheel-ends to seven years. Coverage includes hubs, bearings, seals, hubcaps and spindle nuts, as well as thru-tees and stators for the Meritor Tire Inflation System by P.S.I. when the MTIS option is selected in combination with the AxlePack7.